Matt Crawford is a public relations associate with Pale Morning Media, a national communications firm specializing in outdoor activities (they count Simms, Aquapac, Woolrich and SOG among their clients). He is also a passionate hunter, angler and skier. I recently caught up with him to discuss fishing, clients, gear and industry trends. MC: I’d like to think at least 50, but I don’t really keep track, and I know my ice fishing days were certainly down last year because we barely had winter last year in Vermont. Plus, along about October, fishing takes a backseat to hunting, and I’ll chase anything from woodcock to whitetails. MC: I fished Montana a bit, and a lot around the house in Vermont. I’ve started to target bass with my fly rod, so that started to fill up my dance card. I live on one of the best bass fisheries in the world (Lake Champlain) and my new goal is to get totally dialed in on catching both largemouth and smallmouths with a fly rod. RM: What do you do for your clients? MC: Pale Morning Media is a public relations firm with about a dozen clients. I work directly with Aquapac (waterproof bags), Simms Fishing Products and SOG Specialty Knives & Tools. My title is “Account Director” but that’s kind of all-encompassing, and it depends on what the client’s needs are. In the end, I work directly with the marketing departments of the companies and directly with members of the media who may cover those companies. I do everything from sending samples to the media, to crafting news releases to assisting with social media campaigns. RM: What’s your “must have” piece of fishing apparel? MC: I’d have to say my Aquapac waterproof case for my iPhone, my Simms G4Z waders and my SOG multi tool. And while that’s certainly true, in reality, I honestly can’t fish without a pair of sunglasses. RM: What are the biggest challenges of your job? MC: The challenges are the greatest attractions. I’m usually doing something different every day, for different clients, so it requires me to be flexible and able to change on the fly. Also, given how we communicate these days, there’s a challenge with always being “on.” It’s the phone, it’s Facebook, it’s Twitter, it’s email. Getting a day on the water without having some sort of electronic tethering device is indeed a challenge. 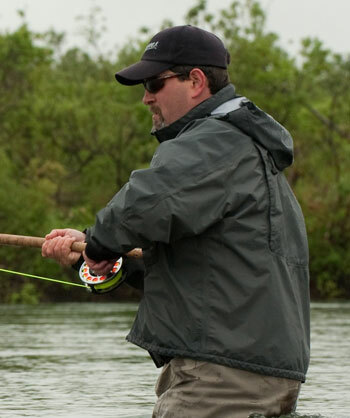 RM: What are the fly fishing industry changes you foresee in the next 3 to 5 years? MC: The biggest challenge I see in the industry is keeping the specialty retailer, the ‘fly shop’ intact. Consumers have options at big box stores or on-line, and all those sales can hurt the smaller fly shops. What I do see is smarter, more active, more vibrant shops rising to the top. Those shops that stick around will be powerful and fun to be a customer of. RM: These days, customers and manufacturers are evolving to the extent that they are practically working together: with customers giving their feedback to a manufacturer so that they can refine a garment/implement/accessory to better suit a customer’s needs. While the benefits are obvious, are there any pitfalls to this type of manufacturer/customer relationship? MC: Besides who gets the patent rights, no, not many pitfalls. I do think some companies have to avoid trying to be all things to every potential customer – you know: do best what you do best. RM: Is there anything about the fishing/hunting apparel industry that you’d like to change or that you think the manufacturers are currently reluctant to consider or do? MC: On the media end, sometimes the never-ending focus on the Next Big Thing seems a little unproductive. I mean, look at waders, for instance. Yes, a company like Simms can introduce a newer version of GORE-TEX material in waders or change a zipper or something, but when a company really has dialed in a product, it’s very difficult to introduce the Next Big Thing every year. Getting something really revolutionary to the market should be a goal, yes, but not every year. Sometimes what’s been on the market for a few years really is that killer product. I’d like to see the good old staples get the attention they’re due. RM: List of three people (living or deceased) that you would like to fish/hunt with plus reason for each choice. MC: My Dad – just one more time. He was the one that introduced me to the outdoors and he had Alzheimer’s at the end of his life. My last few years with him were not like they were when I was younger and we fished and hunted together. He was there when I caught my first steelhead, there when I shot my first duck and deer. I’d like one more chance to go with him again, as he was when I was younger. Leon Leonwood Bean – Here’s a guy who sometimes gets put on the back burner when we talk about the “industry” which in his case could be hunting, fishing or general outdoors. He really revolutionized the industry in many ways, but I’d like to see if he can associate the current trends and issues with what he saw back in the 20s and 30s. Plus he was a New Englander. I’d love to see if the trout streams he haunted or the grouse covers he ran through still hold game. Ted Williams (the late baseball player, not the conservation writer, though I wouldn’t mind that). And the only reason I’d want that is to see just how much pure athleticism factors into being a good angler.